Encounter: Basking sharks and Lesser spotted catsharks. 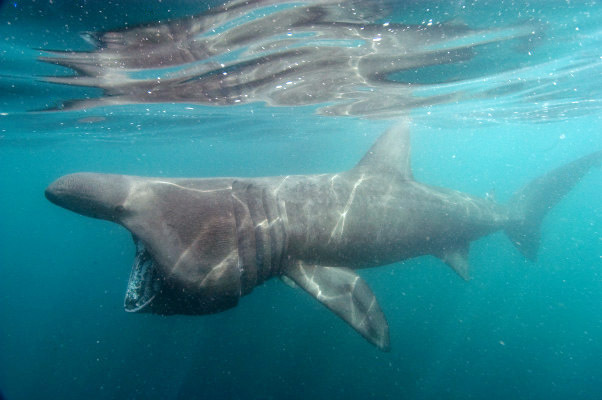 During late spring the seasonal plankton bloom along the south and west coasts of the UK encourage basking sharks to venture into the surface layers close to shore. Divers are dropped in the water in the estimated path of the approaching sharks. This is complicated by the fact that the sharks do not swim in a straight line. So, once in the water the captain who has a better vantage will indicate to the swimmer which way to go. This experience is conducted solely on snorkel as the bubbles generated by scuba units spook the sharks. It is quite strenuous trying to keep up with a leisurely swimming Basking shark as they swim at around 2 knots and the pursuer's movements are hampered by the heavy exposure suits that are necessary in Cornish waters. The Basking sharks are fairly reliable in the respect that at some point each spring they will show up. That however is the extent of what is certain. The problem is that there is no clear time when they will materialize and no guarantee that they will stick around. The best time to organize a trip is in April or May but on the year that I was there the sharks were only seen for about one week. Back in the 1950s there were so many Baskers around the British coastline that a healthy fishery was started to exploit their oil filled livers. In the book 'Shark-O' Captain O'Conner writes that on one day he found himself in a field of Basking sharks acres across. Maneuvering his vessel into the center of this giant school he looked down and noticed that the vastness was not limited to two dimensions and that he could see layers of sharks as deep as the water clarity would allow. That must have been quite a sight. Sadly the sharks were no match for the whaling fleets of that day and in just a few short years the sharks were commercially extinct. Today the remaining sharks are protected in British waters and there is a strict code of conduct for boaters similar to that imposed upon whale watchers. The problem for basking shark watchers then becomes one of how to estimate their arrival. The best way to do this is to stay in contact with the operator and keep travel plans flexible. The sharks are not particularly curious about people so it is best to be as unobtrusive as possible in the water. If you are in good shape you can generally keep up with a feeding Basking shark for about 30 seconds before it out paces you in the plankton rich murk. Sometimes you may be lucky enough to be in a spot where the sharks are turning to stay in a plankton filled area. If you approach the sharks too closely their first defense is to dive. Often they will not surface again in the same area resulting in the end of the encounter. During a day of basking shark chasing you can expect to spend a lot of time on deck scanning the horizon for fins. If you have a zoom camera or can get very close, the basking shark project is always happy to receive new pictures and reports for their database. Follow the links below to find out more about their work. Between Basking shark dives it is possible to join a dive charter or dive off the beach in search of Lesser spotted dogfish aka Small spotted catsharks. These are small, docile little sharks that usually allow a close approach and may even let you pick them up before swimming away. Try Porthkerris reef for this dive. Operators: Mike Anselmi operates the Celtic Cat out of Porthkerris Bay on the Lizard Peninsula. The boat is fast and from his vantage in the high wheel house Mike is able to see the sharks from a great distance. The art of this encounter is the ability to estimate exactly what the sharks swimming pattern will be, and Mike has this down to a fine art. He is a very accommodating host and does his best to educate the snorkellers that he has onboard. Porthkerris divers is also able to rent equipment for shore diving off the beach. Accommodation: There are basic camping facilities at the tiny hamlet of Porthkerris itself and many B&Bs in the surrounding villages. A quaint place to stay close to Porthkerris is the Three Tonnes Pub in St. Keverne which has a lively bar in the evening and full English breakfast included with the rooms. Directions: Porthkerris is a 5 to 6 hour drive south of London. Initially, follow signs to 'The South' and 'Cornwall'. Once in the general area look for signs to 'The Lizard'. Porthkerris itself is not shown on most maps as it is little more than a bay with a dive shop perched above it in a field. It is best to go to the Village of St. Keverne and ask for directions. You'll know that you're getting close when the lanes begin to get so narrow that they are barely wider than the vehicle that you're in. Negotiating your way along thin Cornish lanes with jagged stone walls on each side is all part of the fun.